New Life Spectrum®’s new Hex-Shield medicated aquarium food. New Life Spectrum Premieres Products for Treating Ich and Intestinal Parasites. 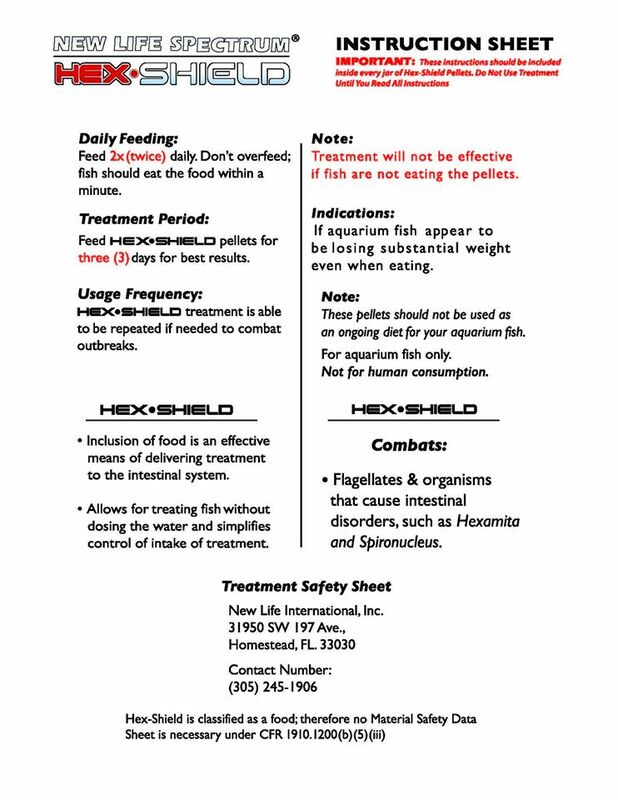 HOMESTEAD, Florida — Sept 4th, 2014—New Life International, creator of New Life Spectrum® aquarium foods, has introduced their new line of medicated fish food and water treatments called New Life Spectrum SHIELD®. The food premiered at the 2014 Marine Aquarium Conference of North America (MACNA) in Denver, Colorado. The line features two formulas. Ick-Shield combats the parasites that cause marine and freshwater ich, as well as other ectoparasites and marine velvet disease (oodiniosis). Hex-Shield treats intestinal parasites such as those that cause Hexamita. Ick-Shield is available as a bath solution powder and medicated pellet food in one, two and three millimeter sizes. Hex-Shield is available as medicated pellets in one through three millimeters. “This is the most significant advance in reducing fish mortality we’ve introduced since the original Spectrum Nutrition formula” said Pablo Tepoot, New Life’s founder. He cites video documentation, available on the New Life Spectrum YouTube channel, showing fifty Achilles Tang in quarantine, treated with Ick-Shield bath solution — none of which came down with Marine Ich (Cyptocaryon irritans) and whom successfully transferred to a display tank where they are seen consuming Ick-Shield pellets. Achilles Tangs are notoriously prone to Marine Ich and typically suffer high mortality when imported. In fact, it was Pablo’s frustrations with losses of his newly acquired Tangs to Ich that prompted him to search for a solution and develop the New Life Shield family of products. Both Marine Ich and Freshwater Ich (Ichthyophthirius multifiliis) is one of the most common aquarium diseases and a leading cause of fish mortality. Hexamita is an infection of the fish’s intestines by flagellated protozoa, and likewise a common cause of aquarium deaths. Common treatments like Copper Sulfate, while effective against Ich, are also highly toxic, stressful to fish, and has a narrow safety margin. Therefore, effective, fish-safe treatment and outbreak prevention is a game-changer for the hobby. “Ick-Shield and Hex-Shield has the potential to save countless fish and keep people from quitting the hobby due to aquarium collapse. It’s just a matter of getting it into people’s hands.” said Ian Tepoot, head of New Life’s Operations. For both Ick-Shield and Hex-Shield, a major benefit is it’s wide safety margin for fish, and that it neither stresses fish nor suppresses their appetites at recommended doses. New Life says that, for the water treatment, they have tested the concentration up to 500% of the recommended dosage without danger to fish. New Life Spectrum®’s new Ick-Shield medicate aquarium food. Ick-Shield water treatments targets the attached parasitic trophont, as well tomite stages of the parasites. Ick-Shield pellets attack the parasitic trophont stage under the skin. In both cases, a full treatment cycle is designed to break the parasite’s lifecycle as the organisms enter a window of vulnerability. The recommended treatment cycle is 21 days for Marine Ich. Hex-Shield has a recommended treatment cycle of three days. Ick-Shield powder is not safe for corals, but is safe for crustaceans and invertebrates that don’t depend on photosynthetic organisms. 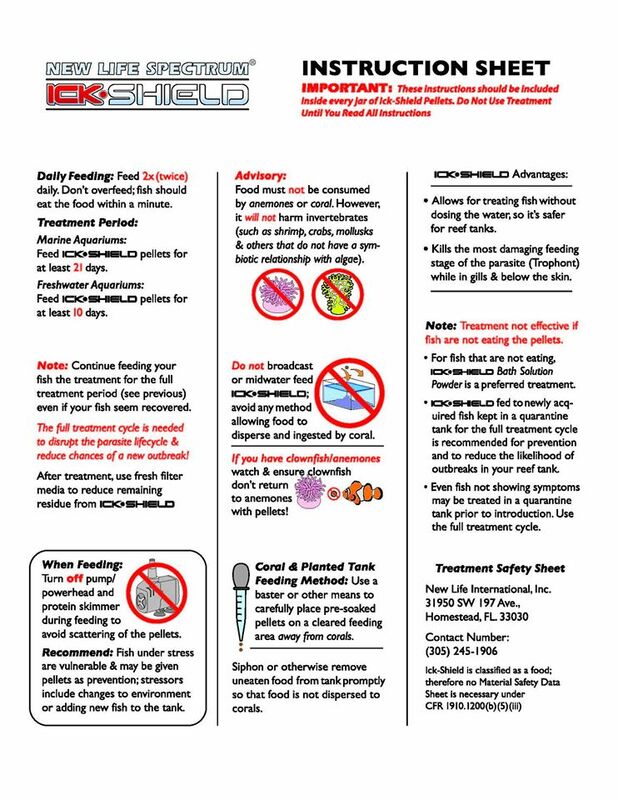 Ick-Shield pellets can be used in a reef tank as long as precautions are taken to not allow corals to consume the pellets, making it less toxic to reef than other Ich treatments. Hex-Shield is safe with corals. We inquired regarding the active ingredients in these feeds; Hex-Shield’s active ingredient was reported as Metronidazole, and Ick-Shield’s ingredient was initially reported as being in the Chloroquin group. Updated: We were also able to locate and share the video of Achilles Tangs referenced in the press release. One of the reasons aquarists are gravitating towards medicated feeds, particularly on the marine side, is their possibility to “treat” sick fish in a reef aquarium environment. In other words, these medicated feeds might be considered “reef safe” when used with proper precautions. New Life Spectrum has furnished instructional graphics for the use of these medicated feeds via the New Life Spectrum Facebook page, which we are including below. New Life Spectrum's Latest Fish Foods Are..